I'm ready to Skype-in to today's Executive meeting! Glenn Glieber (Owner): "... and honestly, I don't care if employees are upset with me for replacing Pepsi with Royal Crown cola in the soft drink machine. There's a Shell station just a block away. They can get a 42 ounce belly buster and nachos with hot peppers for just $1.99 if they are so inclined. It's bad enough hearing the Coke contingent gripe all the time about not having Coke products in the vending machine, now this. It never ends with these people." Meredith Thompson (Merchant): "Kevin, is that you?" Glenn Glieber: "Folks, Monday's presentation went so well that we're going to ask Kevin to Skype-in at least once a week, preferably twice a week. What do you have for us today, Kevin?" Kevin: Today we're going to review repurchase rates by physical channel. Recall on Monday we discussed the fact that 53% of Gliebers Dresses customers will purchase again next year. Here's a slide that illustrates channel-specific behavior. Kevin: "This isn't an uncommon finding, folks. 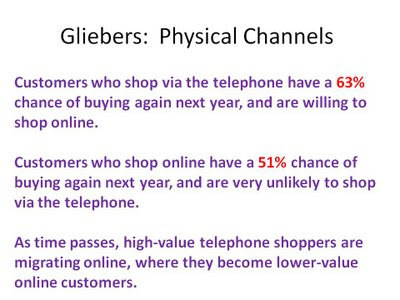 Customers who shop via the telephone tend to be more engaged than online shoppers. But this fact is hurting your business. As customers continue to migrate online, and most of them now have migrated online, they have more choices, and as a result, they become a bit less likely to shop at Gliebers Dresses." Meredith Thompson: "Is this a symptom of our lousy website conversion? I mean, if we're only converting 8% of our visitors, then technically we're letting 92% of our visitors get away. That has to be correlated with the decline in annual retention rate, right? Roger Morgan (Operations and Information Technology): "Oh I doubt that. According to Internet Retailer, our conversion rates are far better than most companies. And remember, Woodside Research gave us a score of 86 in their highly regarded 'Online Retailer Experience Awards'. To top it off, I read a blog post on the Closet Fashionista blog where the author said that shopping with us felt like shoplifting, she felt like she was stealing from us because our merchandise represented such a good value. So I don't think this has anything to do with conversion rates." Sarah Wheldon (Marketing): "Roger, I bought that blog post. We gave the author free dresses for a year in exchange for a few positive mentions on her blog." Pepper Morgan (Creative): "You astroturfed buzz about us?" Sarah Wheldon: "It's called 'marketing', Pepper. The Closet Fashionista blog clearly communicates relationships with favored brands in their disclosure policy. All you have to do is go to the blog, click on the disclosure policy link at the bottom of the page, and then find Article 7.3, about two pages into the document. It's right there for everybody to see." Glenn Glieber: "I love free marketing!" Lois Gladstone: (Chief Financial Officer): "This brings me back to the idea of loyalty programs. Is there any kind of program we could create that would cause an online customer to become more loyal?" Pepper Morgan: "Why couldn't we dot-whack the cover of the September Homecoming Catalog with a message encouraging customers to pick up the telephone and shop with us? Why couldn't that work? Maybe we give the customer 10% off if they shop over the phone?" Roger Morgan: "And then I'll create a contest for our call center employees, whoever does the best job of cross-selling these customers with more merchandise gets $250? We can give $150 for second place, and $100 for third place. That would boost AOV (average order value) enough to cover the cost of the promotion and the cost of the contest, and because the customer is ordering over the telephone, we increase long-term customer value. Everybody wins!" Pepper Morgan: "We'll enlarge the font of the 1-800 number at the bottom of each page of the catalog, and we'll add four pages to the September Homecoming Catalog, allowing us to tell the story of how wonderful our sales staff are. I'd put the hard working call center employees of New Hampshire up against anybody." Sarah Wheldon: "Is it possible that this issue has nothing to do with the catalog? Is it possible that we do everything right with the catalog, only to drive the customer to Google, where every storefront in the world is suddenly a click away? And Kevin, this data isn't entirely accurate. You're looking at physical channels. We know that when we mail a catalog, customers buy online. Your analysis doesn't account for that, yet we know that happens." Kevin: "Yup, it happens all of the time. But we didn't have a field in the database that stored that information so that I could incorporate it into the analysis." Lois Gladstone: "Loyal customers wouldn't shop our catalog, and then go to Google. They're loyal by definition, why would they comparison shop?" Sarah Wheldon: "Maybe our most loyal customers wouldn't behave that way, but almost every other customer I mail would behave that way. Remember, from 2000 - 2004 we spent all that time in these meetings talking about how to use catalog creative to drive the customer online to shop, and we gave all those 20% off offers coupled with free shipping. Well, it worked! We did that, and so did everybody else. Now the customer knows that the online experience is a great big flea-market style bazaar where they can find every item at the cheapest possible price and the fastest possible delivery. So we trained the customer to go online, and the customer now uses Google as a research tool." Meredith Thompson: "Oh I wouldn't go that far. Customers know that we stand for quality, style, fashion, and value." Sarah Wheldon: "Doesn't every company stand for quality, style, fashion, and value?" What's left when everybody has the same items at the same price? Shipping and handling cost, and speed of delivery. We fail on shipping and handling and speed of delivery." Roger Morgan: "Come on Sarah, in 2006 Neptune Research did a secret shopper analysis of fifteen leading brands, including us. Our $12.95 average shipping and handling fee coupled with an average of five day delivery put us right in the meaty middle of the bell curve. Anna Carter charges $2.00 more for shipping and handling than we do, and it takes an average of six days for the customer to receive their merchandise." Meredith Thompson: "Maybe we should mail them more catalogs, or send them more e-mail campaigns. Maybe that would increase the retention rate of online shoppers." Sarah Wheldon: "Telephone shoppers can be profitably mailed twenty-four times a year. We lose money mailing any more than sixteen catalogs a year to online buyers." Pepper Morgan: "So let me get this straight. We spent the first half of this decade giving away margin dollars pushing our customers online. Now our customers are online, a place where only 8% of them convert to a purchase in any given visit and we praise that as a good conversion rate, a place where they can find the same item from five different retailers at a cheaper price than we offer and with faster shipping, and as a result our customers have become less loyal? So in response to that, I am recommending that we try to drive our online customers back to the telephone by offering the customer a discount to make the customer more loyal? That's funny!" Roger Morgan: "That's why we have to have multichannel customers. It's obvious that the online customer isn't desirable. And now, what, three-fourths of our sales happen online? What percentage of our customers could become mutichannel? 40%? 50%?" Meredith Thompson: "The genie is out of the bottle. Kevin's slide says the online customer simply won't shop via the telephone anymore. How does the online customer become multichannel when the online customer doesn't want to shop another channel?" Sarah Wheldon: "The customer is multichannel. She's using the catalog to shop online, that's two channels right there. And then she signs up for e-mail. Three channels. She's clearly multichannel." Pepper Morgan: "And with all that multichannelidity, we're not profitable. So does any of it matter?" Glenn Glieber: "We're going to have to cut this discussion off right here, folks. Kevin, thanks for Skyping-in today. Will you come back on Monday and do this again?" Kevin: "Sure, I'll have another Multichannel Forensics tidbit prepared for the Monday meeting." Glenn Glieber: "Great, thanks Kevin. Now let's move on to the next item on the agenda, entitled 'Call Center Ethics'. It appears that one of our associates lifted a credit card number from Agnes Pinsky of Omaha, NE, as Agnes placed her order, and somehow used that credit card number to fund an evening at the dog track in Council Bluffs. Who wants to take a stab at writing a modification to the call center ethics document?"